Applying for a job isn’t easy. Not only do you have to decide “WHERE” to send your resume; you also have to worry about how you’re going to present it. True, you may have some experience writing resumes in the past, probably gleaned from a quick lesson in college or a sample provided by a colleague, but for most people all their resume really amounts to is just a glorified list of past responsibilities. And that just isn’t going to cut it. Fact is, your resume writing skills probably need some updating. Because these days, it’s no longer enough to just mention that you went to a prestigious school, have an MBA, or that you won a couple of competitions. To compete in the 21st century job market, it’s all about transforming that document from a “boring list of duties” into a sales pitch to wow and amaze employers and make them want to invest in YOU. Because let’s face it, when it comes to employers, when you initially apply for a position, you’re not even really a human being; you’re nothing more than a number, a Word document imported into some Application Tracking Software. Just another email, just another two pages with margins too small and all the same words as the next. Which isn’t to say that you coming from a prestigious university isn’t going to help. But unless you graduated with honors and made a lot of connections while going to school, you’re not always guaranteed to get a job just from your degree, especially if everyone else you’re competing with has the same degree from the same place as you. To succeed, to land those truly amazing roles that will advance your career, your resume needs to be something more, to stand out from the rest… and it needs to work fast, just like a sales pitch, to get your foot in the door and make the employer want to learn more. Unfortunately, saying that you should turn your resume into a sales pitch is easier said than done. It’s not like you just put “For Sale” at the top and send it to a couple of employers and wait for their response. No, that’s not how it works. You need to start thinking like a salesperson, no matter what your discipline. So at this point, as indicated above, your resume is probably just a glorified list of all the duties you’ve had and the places you went to school, probably with an objective at the top which, sadly, is telling the employer what you want from them, rather than what you can offer them. To break away from this outdated way of doing things, you need to look at yourself as a product and sell yourself the right way. So while it’s important for any product to list its ingredients (background), that generally isn’t how it will market itself to potential customers. To do this, you must visualize your resume as something like a sales flier. Fliers are designed to appeal to the eye, both graphically and informationally, and to do so they generally don’t put in every bit of information about a product. They just include what is most likely to gain the attention of readers, with the most relevant information first. Your resume, then, should immediately give an employer the right impression and show just what you can offer right up front, with the finer details better explored elsewhere (in interviews, for example). Remember, employers are largely unconcerned with who you are, especially at this stage; what they care about is what you can offer them and their business. And they generally don’t have a lot of time to determine this. Try putting yourself in the shoes of a potential employer and dissect your background, choosing those elements that best exemplify your suitability for the job and the company. This isn’t always easy and may require research into the company’s style, work culture, history, and products. And you will have to decide how to frame your achievements in such a way as to objectively relate how your “product” is truly what an employer is looking for. You can also think of your resume as a kind of “pre-interview”, only in written form. And much like in interviews, the less you talk about personal stuff and the more you focus on your best selling points, the more active and engaging the whole process will be. This should help to give you an idea of what a resume should be, how it should be framed. In summary, it should be a concise document that quickly and effectively sells your background for a particular role and company, keys in on your best achievements and most relevant skills, and stands out to catch the eye of potential employers. To help reinforce the above ideas, it will also help to consider some examples of what a resume should not be. There is a common misconception (perpetuated by resume-writing books and university career guidance centers) that a resume should either be a mere list of accolades and past work history (like what’s discussed above) or a biography. But if you speak to employers and HR managers, you’ll quickly learn that it’s neither. Your resume may be about you and may contain personal information, but it’s NOT personal. Don’t go using a lot of personal pronouns and having it read like a personal statement for a college application. And it’s NOT a thesis or a dissertation. So not only should you avoid getting too personal (including lists of hobbies, photos, and anecdotes), but you must also avoid the tendency to go on for too long, as you might for a college term paper. Length does not earn you bonus points. Your resume shouldn’t be an exhaustive list. If you spent a few summers helping walk dogs when you were a teenager, while it might count as a job, the hiring manager reading your resume isn’t going to be interested in that when you’re applying for an engineering role at Lockheed. Keep it relevant and on point. You must also avoid the trap of believing your resume is the key to landing a job, because it’s not. You are actually writing the resume to get an interview! It’s the interview that will get you the job. So, when you’re writing your resume, don’t try to cram everything that an employer might ever want or need to know. Rather, one step at a time: you’re looking for the employer to see just enough to want to learn more and that will earn you the in-person interview where you’ll truly be able to shine. Just like your resume should not be a laundry list, it should also not be a shopping list. The old style of putting an objective at the top and transforming your resume into a list of things that you want to buy rather than what you have to sell is one quick way of landing your resume in the trash. Why should an employer be interested in your career aspirations? And seriously, why would you want that to be the first thing an employer reads, especially if they will likely only give you 10 seconds of their time to scan your resume, if even that? So, you know what to avoid (laundry lists and shopping lists) and you know what to include (a sales pitch that quickly grabs attention and focuses on your best qualities and what you have to offer an employer). If you utilize these tips, do your homework, and present yourself well, you should be able to land interviews. But if you get rejected, don’t take it personally; it happens to everyone. If you have prepared and done your best, just take it as a sign that the product you’re selling isn’t what they’re looking for and move on to the next role. And remember that the resume is just the first step to get your foot in the door. Make sure that you deliver, too! 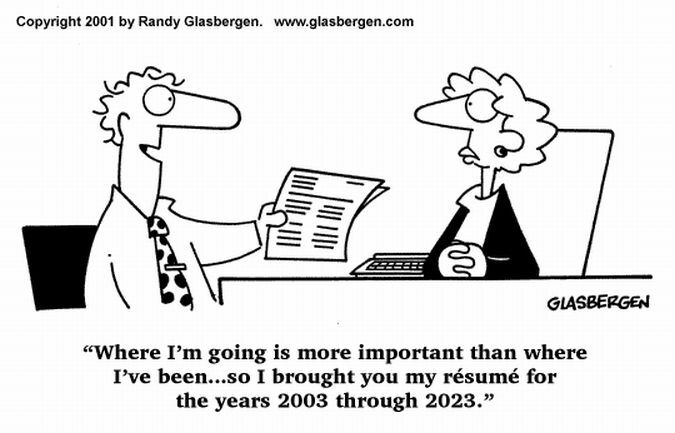 After all, a killer resume would be a waste if you blow the interview. This entry was posted on Thursday, December 4th, 2014 at 6:30 am	and is filed under resume writing. You can follow any responses to this entry through the RSS 2.0 feed. You can leave a response, or trackback from your own site.